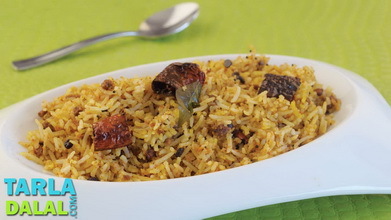 With good doses of milk, fresh cream, ghee, cashews and poppy seeds, korma rice is undoubtedly rich fare, but surprisingly it is not too spicy as it uses only moderate doses of common spices and powders. 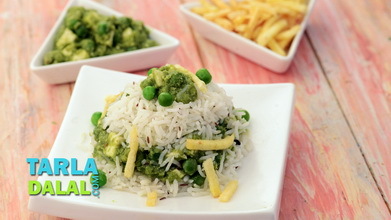 Plus, the use of moong sprouts in the korma gives a healthy twist to the recipe. Baking temperature: 180 C (360 F). Heat the ghee in a deep broad non-stick pan, add the cardamom, cinnamon, cloves and bayleaves and sauté on a medium flame for a few seconds. Add the rice and sauté on a medium flame for 1 minute. Add 3 cups of hot water, salt and turmeric powder and mix well. 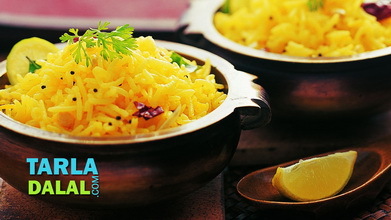 Cover and cook on a medium flame for 8 to 10 minutes or till the rice is cooked. 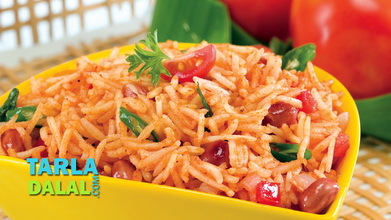 Divide the rice into 3 equal portions and keep aside. Heat the ghee in a deep non-stick pan, add the ginger-garlic paste and cardamom and sauté on a medium flame for a few seconds. Add the onions and sauté on a medium flame for 2 to 3 minutes. 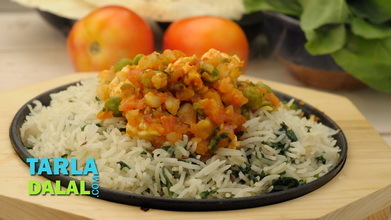 Add the coriander powder, chilli powder and tomatoes and cook on a medium flame for 2 to 3 minutes. 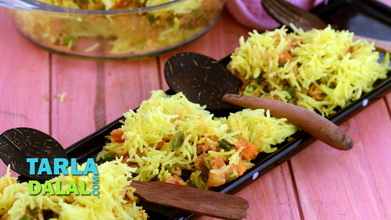 Add the moong sprouts, ½ cup of water and salt and cook on a medium flame for 5 to 7 minutes, while stirring occasionally. Keep aside. 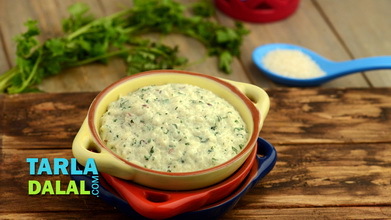 Combine the cashew-poppy seeds paste, milk and fresh cream in a bowl and add it to the moong sprouts mixture. Mix well and cook on a medium flame for 1 to 2 minutes, while stirring occasionally. Divide the korma into 2 equal portions and keep aside. 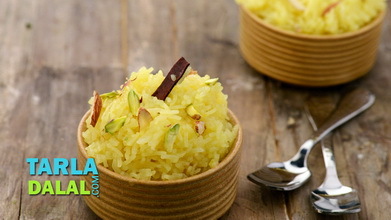 Grease a microwave safe baking bowl with ghee, put 1 portion of rice in it and spread it evenly using the back of a spoon. Pour 1 portion of the prepared korma over it and spread it evenly. Again spread a portion of the rice and korma evenly over it. 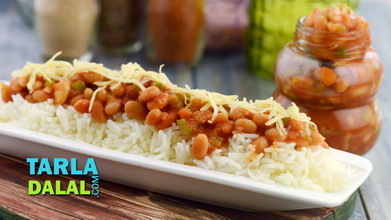 Finally add the remaining portion of rice over it and spread it evenly. Pour the milk over it, cover with a lid and bake in a pre-heated oven at 180oc (360of) for 15 to 20 minutes or microwave on high for 5 to 7 minutes. Just before serving, turn upside down on a big serving plate.